Was Little Sorrel a Racehorse? 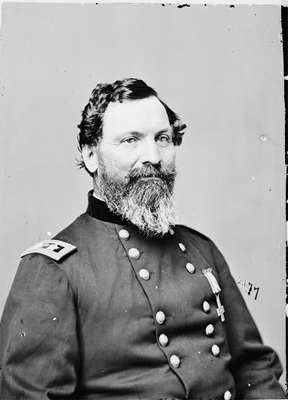 This week marked the 153rd anniversary of the death of Major General John Sedgwick, the highest-ranking Union general to be killed during the Civil War. 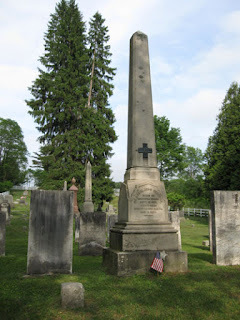 Sedgwick is still remembered in Cornwall, Connecticut, a tiny town in the Northwest Hills of the state. Sedgwick loved Cornwall, which consists of five little Cornwalls—including Cornwall Hollow, the place where Sedgwick was born and was buried. Sedgwick, who served in the pre-war army in Mexico, Florida, and in the Indian Wars, often said that Cornwall was the most beautiful place he had ever seen and that he looked forward to retiring there. He was not to enjoy retirement. Sedgwick died May 9, 1864, on the second day of the Battle of Spotsylvania Court House. He was a determined and respected corps commander and died urging his staff and the soldiers of his VI Corps to persevere in the face of sniper fire. Among his last words was what turned out to be an ironic phrase: "They couldn't hit an elephant at this distance." Seconds later he was shot through the head and died instantly. U.S. Grant considered the loss of Sedgwick to be a terrible blow, as did President Lincoln. Sedgwick has been well remembered with monuments. There are statues at Spotsylvania, Gettysburg, and West Point. There are also two in Cornwall Hollow—both huge. 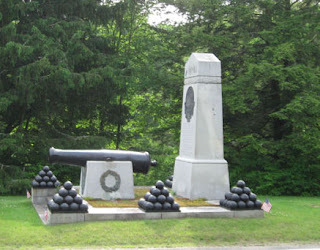 One features a cannon from 1839 and an array of cannon balls (now made of cement, since the originals were melted down during World War II. The other his his grave marker, a tall obelisk in the cemetery across the street from the monument. The town of Cornwall itself has less than 1500 people, and Cornwall Hollow accounts for only a fraction of that. The two monuments dominate the center of the town and ensure that John Sedgwick won't be forgotten in his beloved hometown. April and May are the months when horse racing takes center stage (or at least moves out of the shadows) in the sports world and it’s an appropriate time to talk about one of the most intriguing aspects of the story of Stonewall Jackson’s favorite warhorse Little Sorrel. The odd-looking, undersized horse may actually have been a racehorse. It’s unproven and, at this point in history, probably can’t ever be proven, but there is a modest amount of circumstantial evidence that places him on a racetrack before he went to war. Here’s what we know for sure about Little Sorrel. He was purchased by a livestock broker in southern Ohio and placed aboard a Baltimore and Ohio freight train in early May 1861. He, about a dozen other horses, plus a carload of beef cattle, were destined for the gathering Union troops in the Baltimore area. On May 10 the train was stopped at Harpers Ferry. Thomas Jackson, then in command of Virginia troops at that critical place, needed a horse and chose two off the train. Here’s what we know about the horse himself. He was a small sorrel (or chestnut) gelding, about eleven years old, a pacer, with a pacer’s conformation. He was odd-looking only to those who had never seen a pacer. Here’s what we think we know about Little Sorrel. He was foaled (probably) in 1850 in (probably) Somers, Connecticut, a small town in the north-central part of the state, an area of extraordinary importance in the history of pacing horses in America. The last full-blooded Narragansett Pacer stallions stood at stud in the area. In the neighboring town of Stafford one of the founders of the Standardbred breed, the great Pilot, stood at stud before heading west. He’s the ancestor of most pacing racehorses today as are the Narragansett Pacers (which he may actually have been himself). 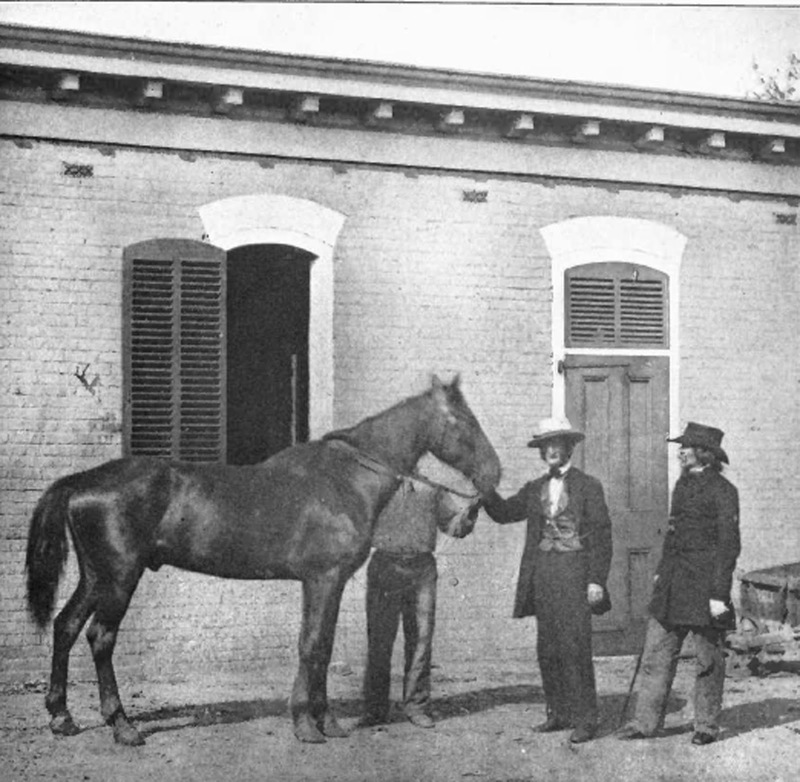 At some point prior to the Civil War, the horse who became Little Sorrel was shipped to southern Ohio to (probably) the small town of Hillsboro. That town was the home of the brother of the man who (probably) bred him in Somers. That region of Ohio was then the center of pacing racing, at the time the less popular form of harness racing. In the 1950’s a pacing racehorse would have to ship to the Midwest to have a decent racing career. Today, the opposite is true. About 80 percent of harness racing features pacers, but in the 1850’s about 80 percent were trotters. We will never know if he raced there because we don’t know his name when he was put aboard the livestock train. But we do know this: William Thomas Pogue, an artillery officer under Stonewall Jackson, was a close and admiring observer of Little Sorrel. In his memoir Gunner with Stonewall Pogue remarked that Little Sorrel was a remarkably fast pacer—that he could “make a mile in about 2-40,” meaning two minutes and forty seconds. That would have been easily good enough for him to have had a successful racing career in Ohio in the 1850’s. It obviously could not have been successful enough to prevent his sale to a horse broker in 1861. Perhaps age had caught up with him. There is more circumstantial evidence about Little Sorrel’s pre-war history and the possibility of him having raced in my book Stonewall Jackson’s Little Sorrel.